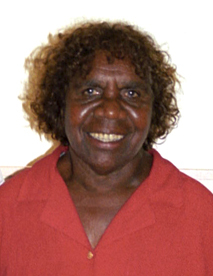 Eunice Napangardi was born in Yuendumu, just north-east of Alice Springs, Northern Territory and was sister to Alice and Pansy Napangardi and Rene Robinson Napangardi. 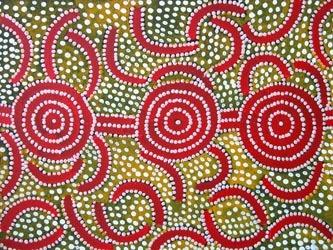 Her Dreamings were Bush Banana [Yuparli], Yurrampi [Honey Ant] and Ngalyipi [Snake/Medicine Vine]. Like many Aboriginal families, these dreamings were co-shared between herself and her siblings. Married to the late Kaapa Tjampitjimpa, one of the leading founders of the Aboriginal Contemporary art movement in Papunya, Eunice was exposed to an extraordinary milieu of Aboriginal painters. Originally, like many husband/wife teams she painted in the background dotting within her husband’s works. 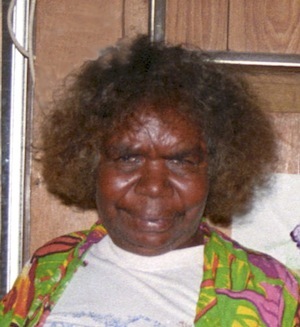 However, in the late 1980’s, she like so many other female Aboriginal artists began to come into their own and Eunice established herself as a leading female Aboriginal Artist. 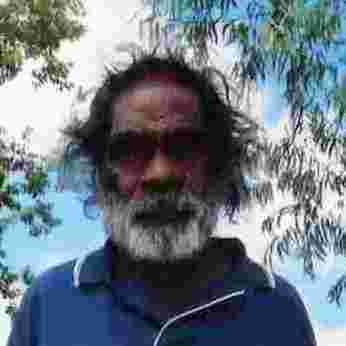 After the death of Kaapa, Eunice began to paint with renowned artist Maxi Tjampitjinpa [now deceased]. The Yuparli or Uparli [Bush Banana Dreaming] which signifies the journey of the Uparli ancestors became Eunice’s trademark signature. 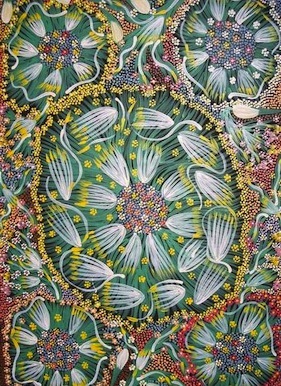 Eunice’s work often depicts the Bush Banana within its various growth cycles. Growing within rock and crevices close to dry river beds, the Yuparli is both known as an important food source and having special healing qualities. Highly detailed, her work is both animated and spirited like its creator. 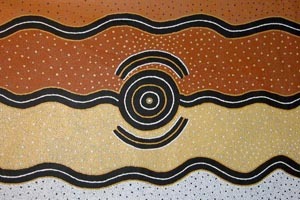 Eunice Napangardi was an extraordinary lady whose artwork continues to preserve Aboriginal culture and tradition. 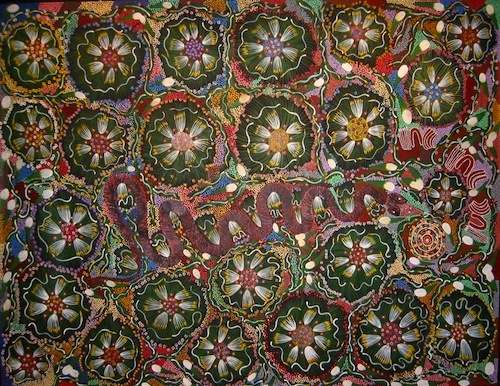 1988	Bicentennial Authority Exhibition Project- being one of only three artist chosen for this unique exhibition she worked with her sister Rene Robinson Napangardi painting their traditional designs on furniture. 1991	Modern Art-Ancient Icon, World Bank Exhibition, Washington D.C. USA. 1992	Traveling International Exhibition, commenced DC Washington World Bank. ■	South Australia Museum, Adelaide, Australia. ■	Richard Kelton Foundation Collection, USA. ■	Mem Aziz private collection, Australia.